CHILE. The Great North: the driest desert in the world. From north to south 1,500 kilometres, from east to west 400/500 kilometres. Three parallel ranges, the Andes the highest one, divide the territory with desert plateaus, changing the configuration into stony, rocky, sandy, and even dunes giving way to the pampas. 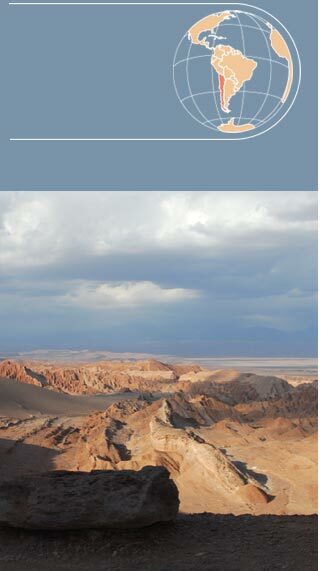 The ‘salar’ are dried salt lakes, the biggest one is the Salar of Atacama. The nitrates, potassium and lithium are plentiful in many of the deposits and their crystallised formation show strange colour arrangements and configurations. Here there are still some rare large and small ponds that form lagoons where micro-organisms are living and reproducing, good food for the numerous pink flamingos. At 4,000 metres high lakes with a wonderful cobalt and turquoise blue mirror the tall 6,000/6,500m mountains and volcanoes. Some endemic aquatic and migratory birds are reproducing right here. Changing level, from the dark of the night to the first lights of the new day, columns of 80 degree steam are rising up from boiling wells, the geysers. The spectacular nature of this ancient land will never stop surprising you on the routes that snake for 1,000/2,000 kilometres on different levels. From the sand to the salar to the pampas, to the almost impracticable passages. Following the “Camino” of the Incas expeditions or the lama caravans, that until the beginning of the last century were still controlling the exchanges from one side of the Andes to the other, here you will admire breathtaking landscapes. San Pedro of Atacama is a very pleasant obligatory stop. The green oasis at the salar edge is the only point where is possible to fill up the vehicles and the last place where we can buy food for the trip. It’s even a meeting point at the crossroads to Bolivia and Argentina whose borders are just 100 km away. Centre of the Likan-antai dynasty, original name of the Atacamegno population. A testimony to their prehistoric origin and to their great culture there are many archaeological sites. Because of the extraordinary aridity, almost unique in the world, its sky is clear and limpid, attracting scientists for all over the world to study the Milky Way and the Black Holes. The third element is the Pacific Ocean. We can meet it on the other side of the costal dunes.